As many of your know, Hurricane Florence recently swept trough our area and resulted in the devastation of large portions of downtown New Bern and the surrounding area. Bank of the Arts was extremely fortunate in that our location suffered minimal damage. Thank you to everyone who came by, called, or emailed to check on our organization and staff. Due to the effects of the hurricane on the area and our residents Craven Arts Council has extended deadlines and drop off times for our poetry contest and exhibitions. Please read below or visit www.cravenarts.org to see the new deadlines, learn more about upcoming opportunities, and submit. The North Carolina Arts Council has compiled a list of resources and organizations for artists and organizations by Hurricane Florence here. Cochlea and Liz Pearse, a trio of flute, harp, and soprano, have offered a free concert at Bank of the Arts Tuesday, September 25, at noon. Please join us, relax, and enjoy great music while taking a break from the effects of hurricane in our town. CAC&G will also be donating half of all sales of our New Bern Bears poster to help with local relief efforts. We hope that everyone is safe and recovering from this disaster, and are grateful to our friends and neighbors that have reached out a hand to help others. Craven Arts Council & Gallery will donate half of all Bear Town Bears Posters to Hurricane Florence Relief until further notice. Thank you to New Bern, Craven County, and everyone in the surrounding area for your support. The only poster in town that has all 50 of the iconic New Bern bears! Exclusively found at the Craven Arts Council. Available online and in store. Shipping for posters is $5. 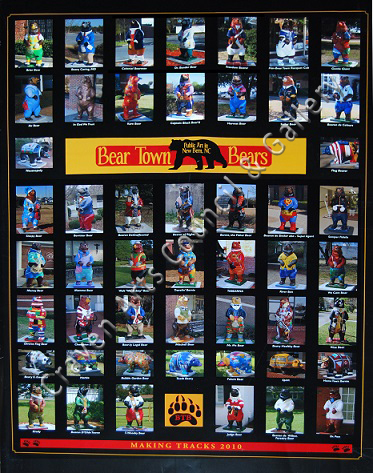 These posters display the 50 bears which were purchased by local businesses and painted by local artists for the 300th anniversary of New Bern in 2010.